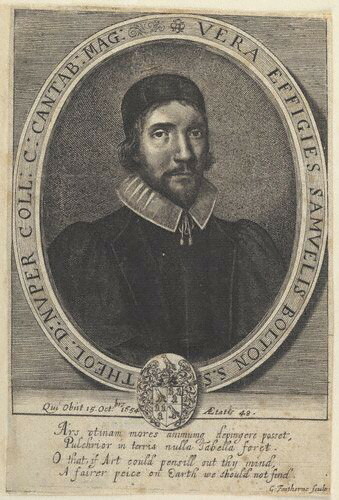 Samuel Bolton (1606–1654) was an English clergyman and scholar, a member of the Westminster Assembly and Master of Christ’s College, Cambridge. Samuel Bolton was the son of William Bolton, of Lancashire. He was born in London in 1606, and educated at Christ’s College, Cambridge. In 1643 he was chosen one of the Westminster assembly of divines. He was successively minister of St. Martin’s, Ludgate Street, of St. Saviour’s, Southwark, and of St. Andrew’s, Holborn. He was appointed, on the death of Thomas Bainbrigg in 1646, master of Christ’s College, Cambridge, and served as Vice-Chancellor of Cambridge University in 1651. He has been identified with the Samuel Bolton who, in 1649, attended Henry Rich, 1st Earl of Holland on the scaffold. He died after a long illness on 15 October 1654. Edmund Calamy preached his funeral sermon. Sin the Greatest Evil. (2 Samuel 24:10) – pdf, 38 pp. The Love of Christ to His Spouse. (Song of Solomon 4:9) – pdf, 55 pp. A Treatise of the Nature and Royalties of Faith. (John 3:16) – pdf, 146 pp. A Treatise of the Slowness of Heart to Believe. (John 1:50) – pdf, 39 pp. A Treatise of the Miserable Condition of Unbelievers – missing. Can you help find this? A Treatise of Hypocrisy. (Isaiah 58:2) – pdf, 93 pp. A Treatise of the Wonderful Workings of God for His Church and People. (Exodus 15:11) – pdf, 69 pp. The Guard of the Tree of Life. A Tossed Ship Making for a Safe Harbour. Also titled, A Word in Season to a Sinking Kingdom. A Vindication of the Rights of the Law and the Liberties of Grace. Want to discuss something pertaining to Samuel Bolton? Leave a public comment below (subject to moderation), or send a private message to the webmaster. I am narrating Digital Puritan Volume 3 Book 1 and this is the portion that I am currently recording. Thank you so much for including this in the DP quarterlies. Thank you Duane for taking the time to narrate these! Look at Sermon Audio for this and more of Duane Linn’s other excellent narrations.